Sun Coffee Roasters is committed to bringing premium, Sustainable Fair Trade coffee to colleges and universities across the country. We work closely with Sustainability Directors and student organizations to support educational opportunities at our partner schools, including sponsorship of campus Fair Trade and Rainforest Days. In addition, we present guest lectures on current issues within the Fair Trade movement. A portion of the proceeds from the purchase of our coffees goes back to your school in the form of student scholarships. We also offer faculty a full curriculum on Sustainable and Fair Trade practices. Our curriculum is designed to enhance classroom study in a variety of subjects including business, sociology, economics, and hospitality management. We assist our Collegiate Dining partners with the development and implementation of a comprehensive Fair Trade coffee program to residential dining, retail, and catering operations. We tailor our blends and point of sale to your specific locations on campus. We provide state-of-the-art equipment and 24x7 service. In addition, we offer barista training on brewing methods and quality control. 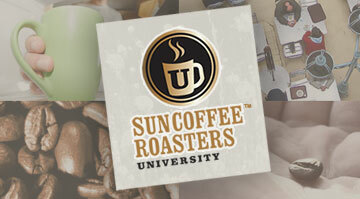 Sun Coffee Roasters' packaging technology allows for customized, private labeling for any school. Incorporating your school colors and logo on your packaging puts your stamp on your coffee and builds school spirit using coffee! The end result is that students, faculty and staff can feel proud to be a part of the Sustainable Fair Trade movement every time they drink a cup of our delicious coffee.